Suhas Tavkar of Bellerose, New York uses an unlikely tool to create his most intricate and unique embossed masterpieces–his fingernails, using a technique called NakhaChitra, an ancient art form. Nakha means fingernail and Chitra means art in Sanskrit. Suhas embosses on paper or soft metal using his imagination, disciplined concentration, and precise hand-eye coordination. One wrong move and it’s back to the drawing board. There are no second chances. “It's a demanding technique,” says Suhas. “If a line or impression fails to satisfy me, it can't be undone." 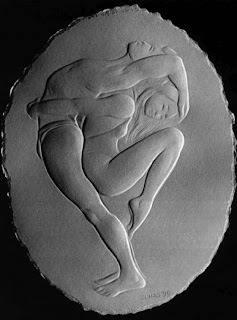 Fortunately for him, each piece of bas relief artwork that Suhas finishes is an instant masterpiece––from the face of Radha, a challenging relief on Strathmore paper to the menacing profile of a bald eagle; to the single line drawing of the contours of a father and son to the provocatively entwined figures of the Pilobilus Dancers. Suhas’s venture into Islamic calligraphy in recent years has received a phenomenal response. 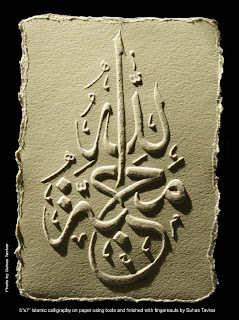 His unique art form allows him to intricately carve the letters in Arabic that appear as gloriously decorative patterns on his reliefs. 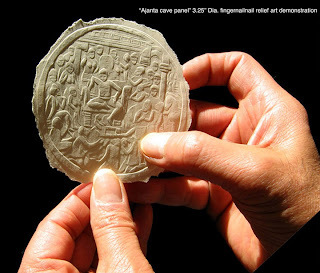 He believes that art is universal and he is open to all religions in his exploration of likely subjects. “My art shows the unique relationship between the human form and the human touch that created it,” he says. Suhas, who hails from Gujarat in India, is a third generation artist in his family working in NakhaChitra. He recalls being introduced to the technique at the age of four and being fascinated with it. A keen observer of nature and its majesty, Suhas always pictured the universe to be a gallery of the creator. He sees everyone as an artist in their own capacity. And Suhas is determined to revive that art form and give it its due place in the art scene. Since graduating from the J.J. School of Arts in India, and immigrating to the U.S. in 1977, Suhas lost touch with his art and focused more on his career as a graphic artist. When he retired in 2007, he decided to dedicate the rest of his life to NakhaChitra, a move he deeply cherishes. Recognition started pouring in soon after. His work has been exhibited at New York State Ballet Gallery, Museum of Natural History, Donnell Center, Tabla Rasa Gallery, Brownson Art Gallery, Chelsea gallery, Hammond Museum, and Queens Museum. 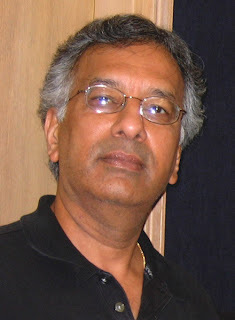 In 2008 Suhas received the Curators’ Choice Award. That same year he was invited to participate in Indo-American Art Council's exhibit called Erasing Borders that explores the contributions of artists whose origins can be traced to the Indian Subcontinent.